Xi Jinping’s emphasis on Confucius has a modern-day political purpose. On September 24, Chinese President Xi Jinping delivered a keynote speech at an international conference commemorating the 2565th anniversary of Confucius’ birth, held concurrently with the Fifth Congress of the International Confucian Association. At least two points in Xi’s speech demand special attention. First, in his speech, President Xi Jinping mentioned the theme of the conference, “Confucianism: World Peace and Development.” Xi emphasized that this is “a topic with a great significance,” since these are “the two major issues of the contemporary world.” In fact, these “two major issues” of peace and development have always been important both globally and to China’s domestic situation, but these issues have become more urgent in recent years. The restless undercurrents in various regions finally burst out with the end of the Cold War. However, the trend toward a multilateral world has yet to create a stabilized world situation. To quote Joseph Nye, “In an information-based world, power diffusion may pose a bigger danger than power transition.” Meanwhile, after years of miraculous economic growth, China faces multiple pressures and challenges domestically from a number of aspects. Beijing has to juggle institutional issues, structural economic issues, social stability issues, ethnic issues, and more. In this context, what should we make of Xi Jinping’s unusually high-profile commemoration of and respect for Confucius? Xi wants to humanize China’s special concern for “peace and development” by placing it in the context of Confucius and the long Chinese tradition of Confucianism. Emphasizing the legacy of Confucius can help legitimize China’s emphasis on “peace and development” for both the domestic public and the international community. Second, Xi’s speech particularly praised traditional Chinese culture, as exemplified by Confucianism. Xi said that the “values and spiritual world of the Chinese people have always been deeply rooted in the fertile soil of China’s traditional culture.” He then claimed that “the Chinese Communist Party is the successor to and promoter of fine traditional Chinese culture.” Obviously, President Xi Jinping wants to emphasize the uninterrupted relevance of Confucianism and Chinese culture. In this shared cultural background, Xi sees political unity, the traditional idea of the Chinese nation as one big family. This is similar to Martin Jacques’ claim that China is a “civilization state” rather than a Western-style “nation state” since cultural elements such as Confucian values played a significant role in the formation and development of the Chinese nation. Of course, the more significant message in President Xi Jinping’s speech underlines the role of the Chinese Communist Party in this “civilization state.” The CCP is held up as “successor to and promoter of fine traditional Chinese culture.” This is a firm attempt to establish the political legitimacy of the Chinese Communist Party, both to the Chinese public and to the West. Under Xi’s formula, to reject the CCP means rejecting Chinese culture itself, including Confucianism. 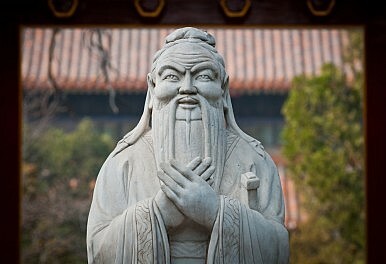 For over 2,000 years, Confucius has been regarded as “the Greatest Sage and Teacher” among Chinese people. Recently, the values and beliefs of Confucianist political philosophy have taken center stage in Chinese politics — political rhetoric dealing with ethical humanism, virtuous rule, people-oriented governance, and so on. China has decided to forge its own path, one separate from the process of Western style modernization (where economic growth facilitates the process of democratization). While seeking its own path, it is both natural and essential for China to look to its own traditions to find essential concepts that might produce political and social cohesion, which is increasingly important to the Party and the whole nation as well. As shown by Xi Jinping’s speech, Confucianism is one such traditional concept being brought in to bolster modern-day governance.